British Council Mexico and ADF have partnered with curator Regina Pozo and publishers Buró-Buró to produce a new publication mapping the design sector in the UK and Mexico in search of common denominators. Do, Flex, Test - Dialogues in Design Making,designed by Tania Alvarez Zaldivar presents the result of an incredible journey of mutual learning and discovery, and profiles a select group of contemporary designers and makers that are helping to shape the wider design sector in both countries. All of the UK contributions featured are linked, in one way or another, to the Maker Library Network, which will soon expand to Mexico, connecting Mexican designers and makers to the network as it expands. The project is part of the Dual Year of UK and Mexico 2015, the biggest ever platform of UK cultural, academic and trade projects to take place across Mexico and an unprecedented showcase of Mexican culture in the United Kingdom. More than a survey, the bilingual publication paints a picture of shared themes and goals across both sides of the Atlantic, highlighting the potential for a continued dialogue and exchange between British and Mexican designers and makers in 2015 and beyond. 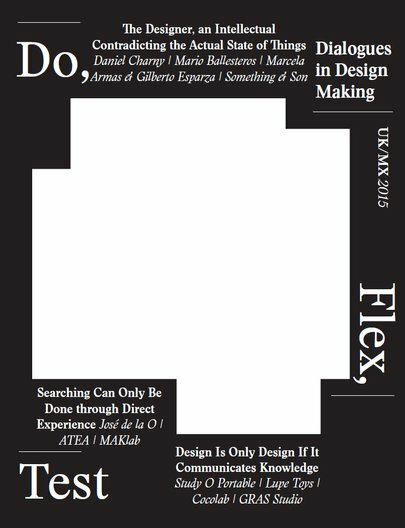 Do, Flex, Test - Dialogues in Design Making will be launched in Mexico City on Thursday 10 September at at Laboratorio para la Ciudad, which organised Hacedores CDMX, the first ever maker fair in Mexico. The publication will also have a UK launch during London Design Festival, and further details will be announced soon. For detailed information on the Mexico launch, visit the Laboratorio para la Ciudad website.